Although we just finished up the In Place exhibition at Light Grey Art Lab, we are still celebrating the fantastic artists from the show, who spend their days making beautiful and informed images, building worlds, creating spaces to live in and visually explore. I would like to introduce artist Juan Carlos Barquet, a freelance illustrator hailing from Mexico City. With a passion for drawing and painting, he finds inspiration from how science and art merge into new disciplines. His work has appeared in collective exhibitions from New York, London, and Bilbao as well as various magazines and publications. 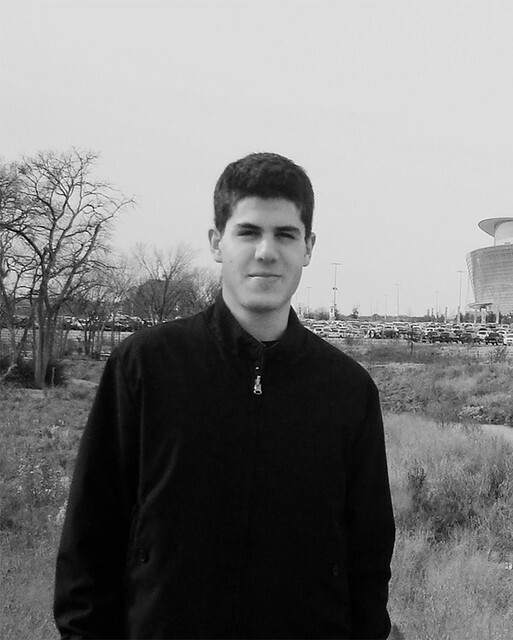 Winner of the 2013 Illuxcon scholarship, Juan hopes to work within the fields of animation and visual effects. Can you tell us a little about the piece you made for In Place? Process, research, mood? The piece I did for In Place is a cenote, which is a natural sinkhole, created by the collapse of limestone that exposes water underneath. The subject matter attracted me not only because of the richness of the natural environment, but also due to the spiritual meaning that the Mayans assigned to these places. It is also interesting that cenotes are probably the result of the meteorite impact that extinguished the dinosaurs more than 60 million years ago. To create the painting I started with small charcoal thumbnails on toned paper, and then did a couple color comps in Photoshop to establish the mood; I gathered some reference pictures to inform the details and finally took the piece to its final state. You create spectacular and intricate backgrounds everyday and there are so many interesting places around the earth, so how did you select or find inspiration your location for In Place? Thank you! I saw many cenotes when I visited the Yucatán Peninsula, and even did some underwater diving inside them – cenotes are usually entrances to massive subterranean cave systems, and exploring them was amongst the most inspiring experiences I have had in my life. I remember being fascinated by the way light behaves in environments like these, cascading through the rocks and water, so I was especially interested in that when designing the image. It was hard deciding whether I wanted to show the underwater landscape or the outside appearance of the sinkhole, but I ended up choosing the latter because I figured it would better represent this type of formation. 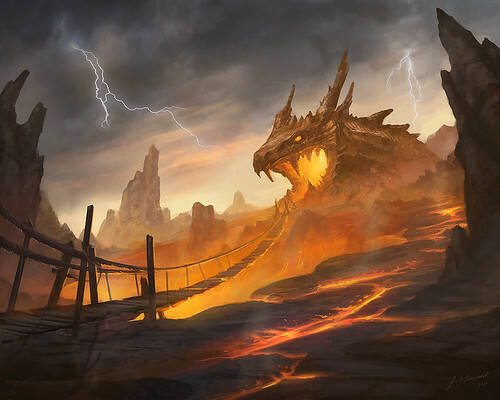 When you are creating landscapes for fantasy games, does your process change? What are the differences between your professional and personal work? There is definitely more creative freedom when I’m doing my own work. This usually allows me to experiment and give myself more technical challenges than I would try when working professionally, so personal pieces often end up being my best. That said, I also enjoy having the direction and structure that comes with working for a client. When doing personal work I tend to think too much and change things over and over, which results in a lot of pieces never being finished. 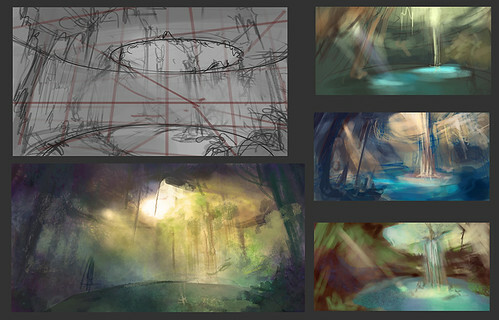 It depends on the piece, but I usually try to understand my subject as much as I can before starting a piece. Even though I paint otherworldly scenes, a lot of inspiration for color and design comes from the real world, so I try to sketch outside as much as possible. If observing actual objects or places is not an option, I look at lots of pictures for inspiration. Still, I find that using reference is good at later stages of a painting, but for me it is best to work from imagination at first and not be restricted by other images. What are some of your favorite projects so far? Professionally or personally, what projects have moved you to create? I love doing science fiction. Most of my commissions have been fantasy oriented (castles, magic, medieval scenes and that of kind of thing), and while I enjoy that a lot, I just love envisioning futuristic, technologic worlds. The Power of Tomorrow, which I did for the yearly exhibition Desktopography, is probably the piece I’ve had most fun with. I am also drawn towards dystopian settings. A great inspiration for me was the movie Blade Runner, and also books like 1984 or Brave New World. In many ways, stories like these are very real and relevant, and they say a lot about the world we live in. Your landscapes tend to be very epic, expansive, and quiet. How do you engage with the viewer, draw them in, or create discovery in your art? It is important for me to have credibility a landscape, which is why I think that observing the world is so essential, but I try to incorporate an element of dreams, wonder or surprise into each piece. Whenever possible, I try to use color, composition and design to reinforce the story, give a backdrop to the scene or add emotion. I find it useful to imagine myself in the environments; sometimes I write a little paragraph, just for me, so I have little narrative clues to give direction to the piece. You include characters in some of your work. What kind of characters, beasts, subjects are you most interested in? For me it’s often less about the characters, and more about the world they live in. 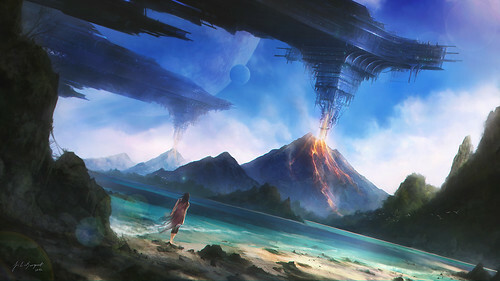 Once I have imagined a setting, I start thinking which kind of life forms, if any, could possibly be there. Maybe it’s humans, but they’re part of an unknown civilization. I love dragons, and I’m working to understand them –and draw them– better, but like all fantasy, it’s all about taking real world things and going crazy with them. What other artists, website, resources do you look at? There are too many to name: I constantly study the work of masters like Leonardo, Caravaggio, Rembrandt or Sargent. I always try to go to museums, but sites like the Google Art Project are also great for this. I love the landscape painters of the Hudson River School like Church or Bierstadt, but I am also inspired by contemporary fantasy illustrators like James Gurney and concept artists such as Andree Wallin. I read blogs like Gurney Journey, Muddy Colors, ChrisOatley.com or The Artorder regularly. I follow so many artists, art students and art directors on the social networks that I am inspired every time I turn on the computer. What projects are you currently working on? What is upcoming for you? Besides being active in the international art collectives Hysterical Minds and The Luminarium, I am currently in the matte painting team of a Spanish short film (I will share more about that when it is closer to being released). I continue to do freelance jobs for card game companies and private clients from time to time, but right now school is my main priority and what takes up most of my time. I am also starting to learn to play the guitar and I work hard every day to become the best draftsman I can be. Thanks Juan! You can check out more of Juan Carlos Barquet's work on his website as well as check out his artwork for the In Place Exhibition and the In Place book on our Light Grey Shop.